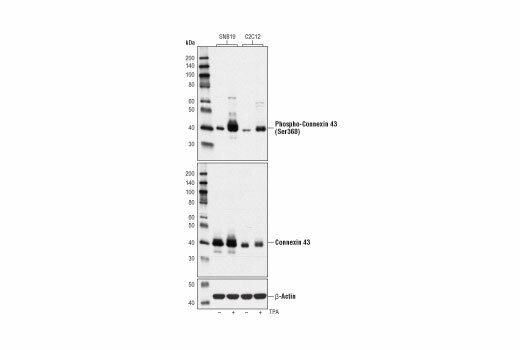 Western blot analysis of extracts from SNB19 and C2C12 cells, untreated (-) or treated with TPA #4174 (200 nM, 30 minutes; +), using Phospho-Connexin 43 (Ser368) (D6W8P) Rabbit mAb (upper), Connexin 43 Antibody #3512 (middle) or β-Actin (D6A8) Rabbit mAb #8457 (lower). Immunoprecipitation of phospho-connexin 43 (Ser368) from SNB19 cells treated with TPA #4174 (200 nM, 30 minutes). Lane 1 is 10% input, lane 2 is Rabbit (DA1E) mAb IgG XP® Isotype Control #3900, and lane 3 is Phospho-Connexin 43 (Ser368) (D6W8P) Rabbit mAb. 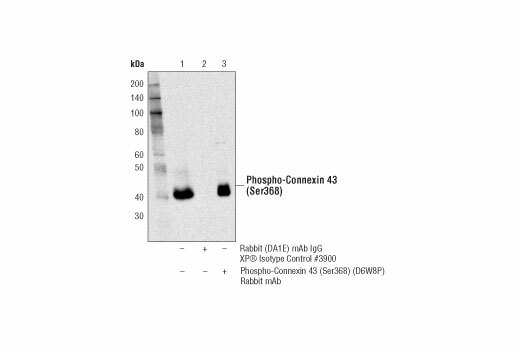 Western blot analysis was performed using Phospho-Connexin 43 (Ser368) (D6W8P) Rabbit mAb. Phospho-Connexin 43 (Ser368) (D6W8P) Rabbit mAb recognizes endogenous levels of connexin 43 protein only when phosphorylated at Ser368. Monoclonal antibody is produced by immunizing animals with a synthetic peptide corresponding to residues surrounding Ser368 of human connexin 43 protein. Connexin 43 (Cx43) is a member of the large family of gap junction proteins. Connexins assemble as a hexamer and are transported to the plasma membrane to create a hemichannel that can associate with hemichannels on nearby cells to create cell-to-cell channels. Clusters of these channels assemble to make gap junctions. Gap junction communication is important in development and regulation of cell growth. Phosphorylation of Cx43 is important in regulating assembly and function of gap junctions (1,2). Ser368 of Cx43 is phosphorylated by protein kinase C (PKC) after activation by phorbol esters, which decreases cell-to-cell communication (3). Src can interact with and phosphorylate Cx43 to alter gap junction communication (4,5). Lampe, P.D. et al. (2000) J Cell Biol 149, 1503-12. Giepmans, B.N. et al. (2001) J Biol Chem 276, 8544-9. Lin, R. et al. (2001) J Cell Biol 154, 815-27.